Successfully Added AquaCAM Waterproof Point and Shoot HD Camcorder (Full HD 1920 x 1080, HDMI) to your Shopping Cart. 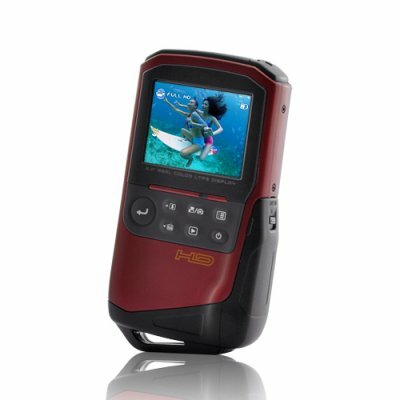 AquaCAM Waterproof Point and Shoot HD Camcorder - reach new depths and capture new levels of exhilaration with this full HD (1920 x 1080) waterproof camcorder. Full HD, 1920 x 1080, 30 FPS - that's what you get with the AquaCAM camcorder. If you haven't experienced full HD yet, you're missing out. Imagine being able to capture every single frame and record every single action in super high resolution - without missing a second! Despite being a Full High-Definition point and shoot camcorder though, the AquaCAM can also capture native 5 megapixel photos - just like those taken with a dedicated digital camera! Thanks to the hardware and real-time interpolation technology, you can easily capture even higher-resolution images at up to 8 megapixels. This waterproof point and shoot camcorder operates year-round in all kinds of weather conditions. Not only can you use it during rain or snow, you can also go reach a depth of up to 3 meters underwater for water sports like wake boarding, water rafting, diving, and even winter sports such as skiing, and snowboarding. It used to be that camcorders were reserved only for special occasions. Family outing? Time to bring the camcorder. Son's graduation? Better dust off the old video camera. But now, experience the ideal combination of portability and usability with the AquaCAM. Designed to feel comfortable in your hand and light in your pocket, this point and shoot camcorder is compact enough to carry anywhere and use at anytime. Finally a camcorder for the video enthusiast who wants it all - an inexpensive yet powerful point and shoot camcorder that captures full high definition videos in 1080p resolution and doubles as a high quality still digital camera. Better yet? It's waterproof. Don't delay, click "Add to Cart" right away and in a few days you could be the proud owner of a AquaCAM point and shoot HD camcorder! Brought to you by the leader in factory direct China electronics - Chinavasion.